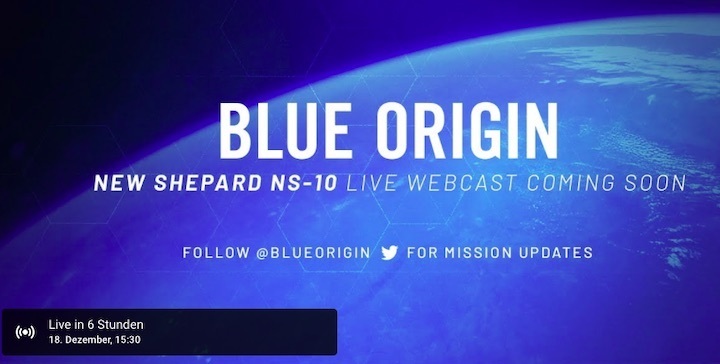 Blue Origin’s next New Shepard mission (NS-10) is currently targeting liftoff tomorrow at 8:30 am CST / 14:30 UTC. 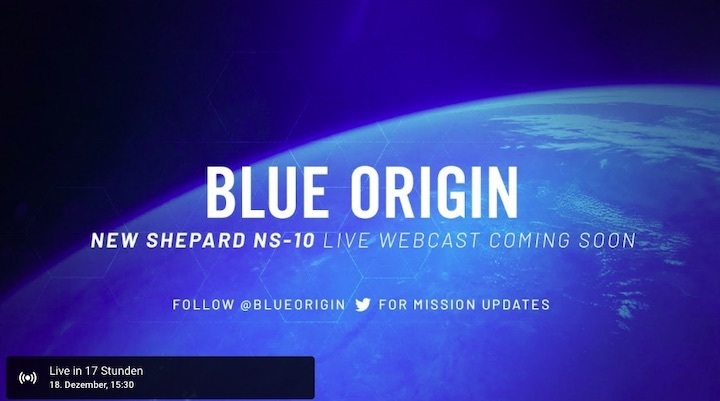 This will be the 10th New Shepard mission and is dedicated to bringing nine NASA-sponsored research and technology payloads into space through NASA’s Flight Opportunities program. 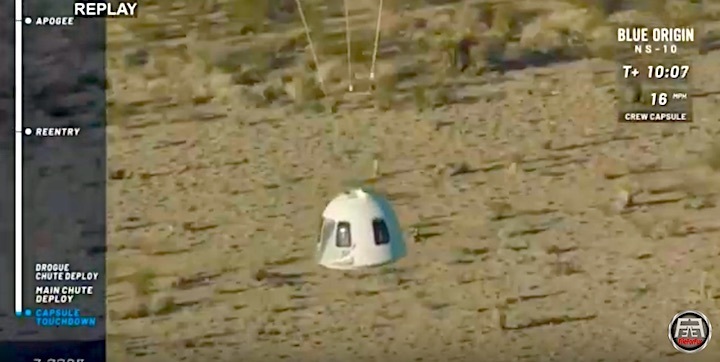 Johns Hopkins University Applied Physics Lab: On its second flight with Blue, the EM Fieldexperiment will observe and collect data on the naturally occurring electromagnetic fields both inside and outside New Shepard during the launch. Principal Investigator Dr. Todd Smith will use success of this experiment to determine how global measurements of the Earth’s electromagnetic field can be conducted in the future. University of Central Florida: Two teams led by Dr. Josh Colwell and Dr. Addie Dove both have planetary science payloads on NS-10. The Collisions Into Dust Experiment (COLLIDE)aims to understand how dust particles react after surface contact during exploration missions to places such as the Moon, Mars and asteroids. The Collection of Regolith Experiment (CORE) addresses the unique challenge of collecting and analyzing material samples in microgravity. Make sure to follow us on Twitter for launch day updates and join us at BlueOrigin.com to watch the launch live! Update for 10:55 p.m. PT Dec. 18: Launch of the New Shepard suborbital spaceship has been delayed until Dec. 21 at the earliest, due to a ground infrastructure issue and weather concerns, Blue Origin said in a tweet. Previously: Amazon billionaire Jeff Bezos’ Blue Origin space venture says it plans to send nine NASA-sponsored payloads to space and back on the 10th uncrewed test flight of its New Shepard suborbital spaceship. 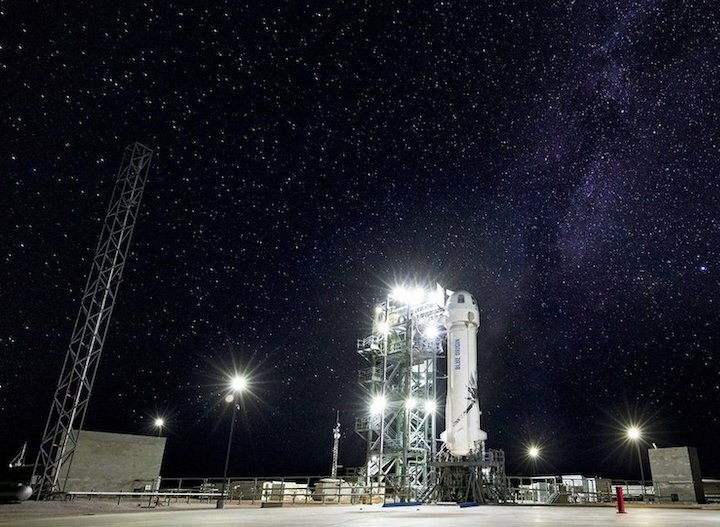 Liftoff was originally set for 8:30 a.m. CT (6:30 a.m. PT) Dec. 18 from Blue Origin’s suborbital launch complex in West Texas, with video coverage to be live-streamed via Blue Origin’s website. 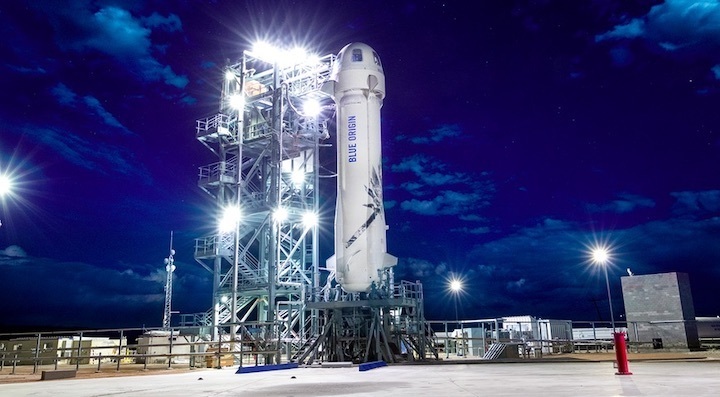 If Blue Origin sticks to its schedule, the flight will come five months after New Shepard’s most recent test, and a week after billionaire Richard Branson and his Virgin Galactic venture sent their SpaceShipTwo rocket plane beyond the 50-mile altitude mark for the first time. Four research experiments accompanied the two pilots aboard Virgin Galactic’s space plane, dubbed VSS Unity. Blue Origin will be flying its nine payloads under the auspices of the same program, known as the NASA Flight Opportunities Program. Three experiments will have flown aboard both spacecraft. “Blue supports NASA’s Flight Opportunities program and its role in perfecting technology for a future human presence in space,” the company said in a news release. Earlier this year, NASA said Blue Origin and three other companies would be eligible to draw upon a $45 million pool of funding for payload flights over a span of five years. “NASA is thrilled to have established flight providers and partners supporting new technology development with wide applications,” Ryan Dibley, launch campaign manager at NASA’s Armstrong Flight Research Center, said in a news release. Having experiments fly on multiple vehicles may reveal refinements that would lower risk or accelerate technology development, Dibley said. 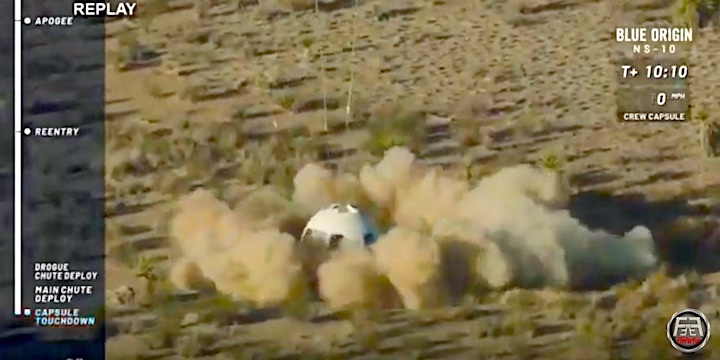 No people have yet flown to space on New Shepard, but versions of the booster and crew capsule have been tested nine times in autonomous mode. 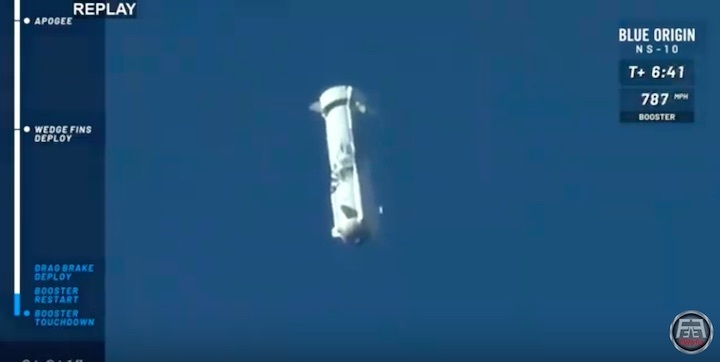 The flight profile typically calls for the booster to send the capsule up to heights beyond the 100-kilometer (62-mile) altitude mark. 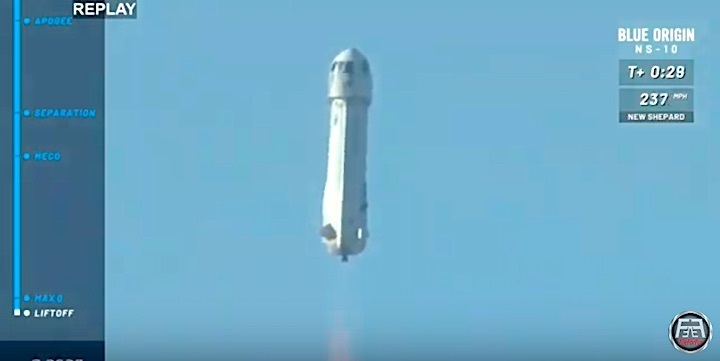 The booster then flies itself back down to a landing, while the capsule drifts to the ground on the end of a parachute. A year ago, Blue Origin started putting a sensor-laden flight-test dummy nicknamed Mannequin Skywalker in one of the crew capsule’s six seats. If test flights continue to go well and the dummy holds up as well as it has, Blue Origin could start putting its employees onboard a human-rated New Shepard spaceship next year, with commercial passenger flights to follow. Carthage College Space Sciences Program: The Modal Propellant Gauging experiment led by Kevin Crosby is a joint effort with the NASA Kennedy Space Center Cryogenics Laboratory. It demonstrates a way to measure fuel levels in microgravity by using sound waves. Controlled Dynamics Inc.: The Vibration Isolation Platform (VIP) aims to separate payloads from the normally occurring vibrations experienced during spaceflight. The apparatus should give researchers a clear understanding of microgravity’s effects on their research results. The team is led by Scott Green. VIP also flew aboard Virgin Galactic’s VSS Unity. 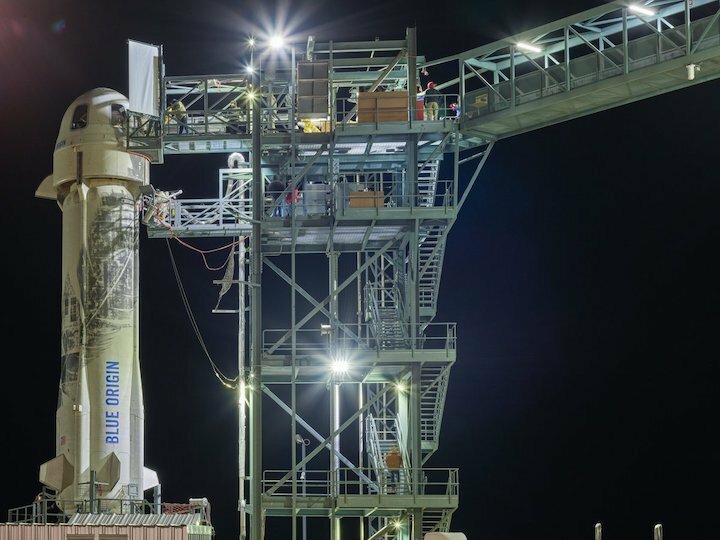 Johns Hopkins University Applied Physics Lab: On its second flight with Blue, the EM Field experiment will observe and collect data on the naturally occurring electromagnetic fields inside and outside New Shepard during the launch. Principal investigator Todd Smith will use this experiment to determine how global measurements of Earth’s electromagnetic field can be conducted in the future. NASA Johnson Space Center: On its third flight on New Shepard, the Suborbital Flight Experiment Monitor-2 (SFEM-2), led by Katy Hurlbert, will analyze various aspects of the flight environment during New Shepard’s mission profile, measuring cabin pressure, temperature, CO2, acoustic conditions, acceleration and more. The data collected will help future researchers on New Shepard design the most effective experiments for the vehicle. Purdue University: Steven Collicott’s payload looks at Zero-Gravity Green Propellant Management Technology, which aims to help advance the use of a safer and more environmentally friendly rocket propellant by better understanding the fuel’s behavior in microgravity. University of Central Florida: Two teams led by Josh Colwell and Addie Dove have planetary science payloads on New Shepard. The Collisions Into Dust Experiment (COLLIDE) aims to understand how dust particles react after surface contact during exploration missions to places such as the moon, Mars and asteroids. The Collection of Regolith Experiment (CORE) addresses the unique challenge of collecting and analyzing material samples in microgravity. COLLIDE also flew aboard VSS Unity. University of Florida: Rob Ferl and Anna-Lisa Paul are adapting technology designed for the International Space Station to suborbital uses with their experiment, Validating Telemetric Imaging Hardware for Crew-Assisted and Crew-Autonomous Biological Imaging in Suborbital Applications. By recalibrating the way data is collected, the experiment will enable more biological research on suborbital missions. This experiment also flew aboard VSS Unity. In addition to its suborbital New Shepard space program, Blue Origin is working on an orbital-class rocket called New Glenn. There’s also a lunar lander called Blue Moon in the works. 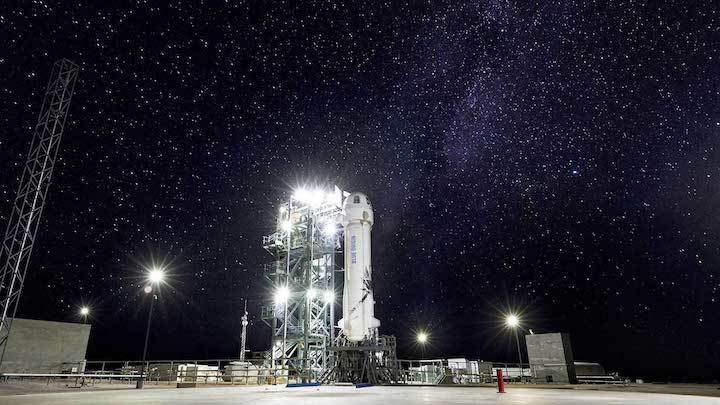 Blue Origin’s New Shepard spacecraft and its hydrogen-fueled BE-3 rocket engine are built at the company’s headquarters in Kent, Wash.
New Glenn will use a more powerful engine known as the BE-4, which is fueled with liquefied natural gas. BE-4 engines are currently being manufactured in Kent and tested in Texas. However, engine production is expected to shift to Alabama, with the New Glenn rocket destined to be built and launched in Florida. Blue Origin's 10th New Shepard flight — scheduled to launch earlier this week before being delayed to no earlier than Friday (Dec. 21) — has now been pushed to early 2019, company representatives said. 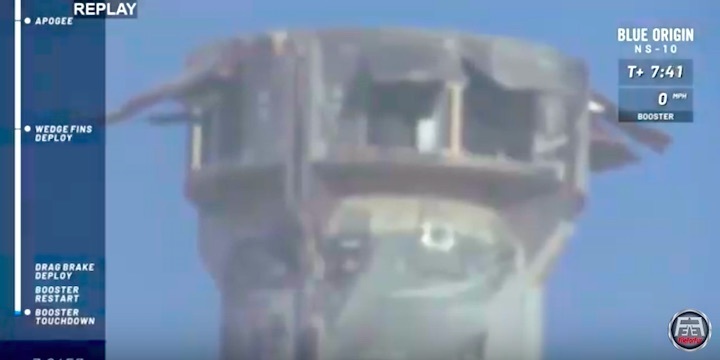 The first launch scrub on Tuesday (Dec. 18) was caused by "a ground infrastructure issue" at the company's launch site in West Texas, according to announcements made at the time. 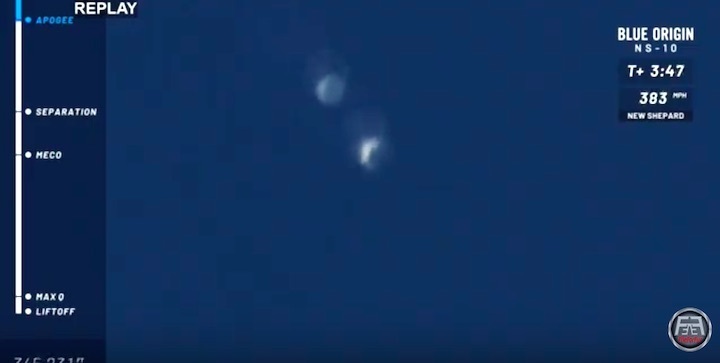 But as Blue Origin was working to address that problem, something else appears to have raised red flags. "Through fixing the ground infrastructure issue, we have determined additional systems need to be addressed. We have changed our target to early 2019 for next launch attempt. Stay tuned for updates," the company wrote in a Twitter update late Wednesday (Dec. 19). Blue Origin is the rocket company created by Amazon founder Jeff Bezos. 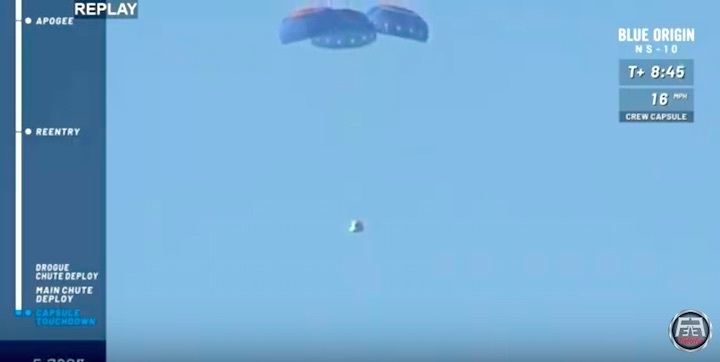 New Shepard is the company's reusable suborbital flight system, designed to carry both humans and robotic payloads, and it makes its journey in 11 minutes. The company is also working on a heavy-lift launch vehicle designed to reach Earth orbit, called New Glenn, which is unlikely to fly before 2020. 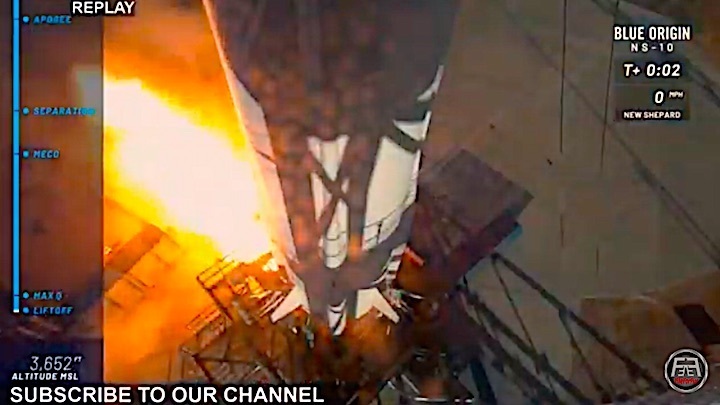 For this week's scrubbed launch, the rocket was loaded up with nine different NASA-sponsored payloads, including experiments to observe electromagnetic fields, study rocket propellant behavior in microgravity and examine how dust particles behave when collected in microgravity. 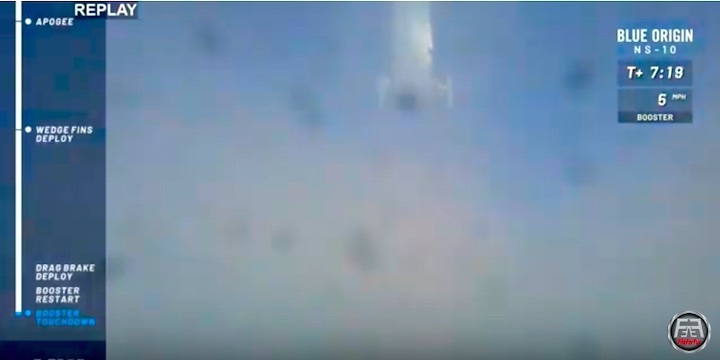 On Dec. 18, after the initial scrub, Blue Origin confirmed that the vehicle was in good condition. The delayed launch will join a busy slate of 2019 commercial flights, as both SpaceX and Boeing aim to carry humans to the International Space Stationfor the first time and Virgin Galactic will build on its successful suborbital flight of Dec. 13. WASHINGTON — Blue Origin has rescheduled a test flight of its New Shepard suborbital vehicle for Jan. 21 as the company edges closer to flying people into space. The company announced Jan. 18 that it had rescheduled the flight, designated NS-10, for Jan. 21 from the company’s test site in West Texas. The announcement coincided with the release of a notice to airmen, or NOTAM, by the Federal Aviation Administration restricting airspace around the site between 8:30 am and 3 p.m. Eastern Jan. 21 through 23. Blue Origin had planned to carry out the flight Dec. 18, but postponed it because of an unspecified ground infrastructure issue. Once that problem was corrected, the company said Dec. 19 that it “determined additional systems need to be addressed,” and pushed back the launch to early 2019. 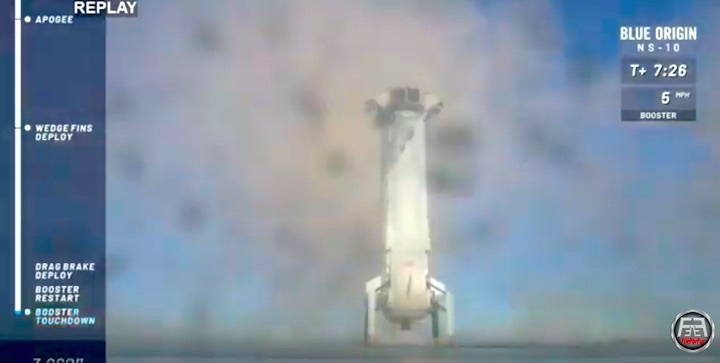 The flight will be the first for New Shepard since a July 18 launch that tested the abort motor in the crew capsule. 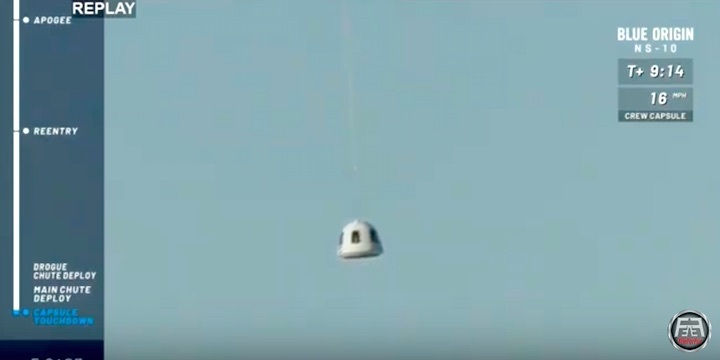 The motor fired shortly after the capsule separated from its propulsion module, with the capsule making a regular landing under parachutes while the propulsion module made a powered vertical landing. The vehicle will be carrying nine experiments provided by NASA’s Flight Opportunities program. The experiments on the flight are from a mix of universities, institutes and NASA centers. The payloads range from microgravity research payloads in fields like fluid dynamics and planetary science to technology demonstrations that will monitor conditions in the vehicle. The upcoming flight will not carry people. However, company officials said in recent weeks that they expect to start flying people on New Shepard later this year. “Soon — we’re aiming for this year — we will be putting people in that capsule,” said Ariane Cornell, head of astronaut strategy and sales at Blue Origin, during a panel session on commercial space at the annual meeting of the Transportation Research Board here Jan. 16. The company, though, has yet to start selling tickets for commercial flights of New Shepard, or even set a ticket price, Cornell said at another conference earlier this month. Tourists won’t be the only people Blue Origin plans to fly on New Shepard missions. “We will be putting scientists and engineers in the capsule with their experiments as well, for tended payloads,” she said. Blue Origin announced Sunday it has postponed a launch of its single stage New Shepard suborbital booster from Monday as the commercial space company moves closer to flying people to the edge of space. 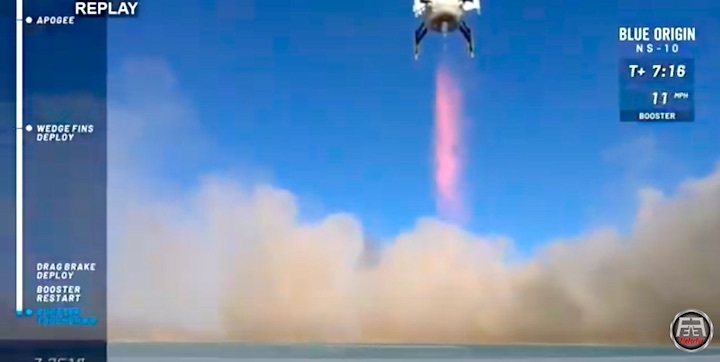 The company, founded by Amazon’s Jeff Bezos, said in a tweet Friday that teams had resolved an unspecified “ground infrastructure issue” that delayed the mission from December, and weather looked good for launch at 9 a.m. CST (10 a.m. EST; 1500 GMT) Monday from Blue Origin’s test facility north of Van Horn, Texas. 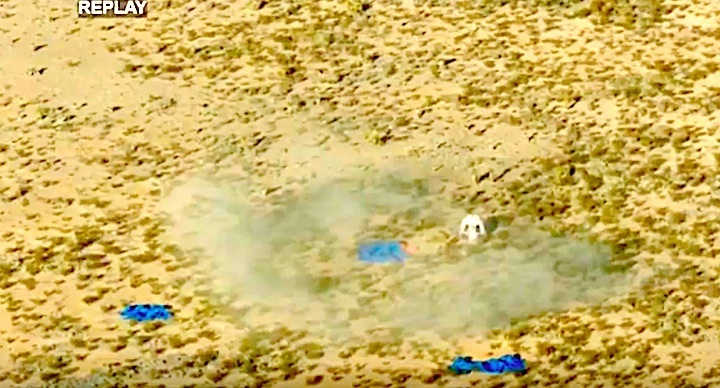 Blue Origin tweeted Sunday that the launch was postponed again, citing high winds at the launch site and an issue with the New Shepard vehicle. A new launch date is pending. 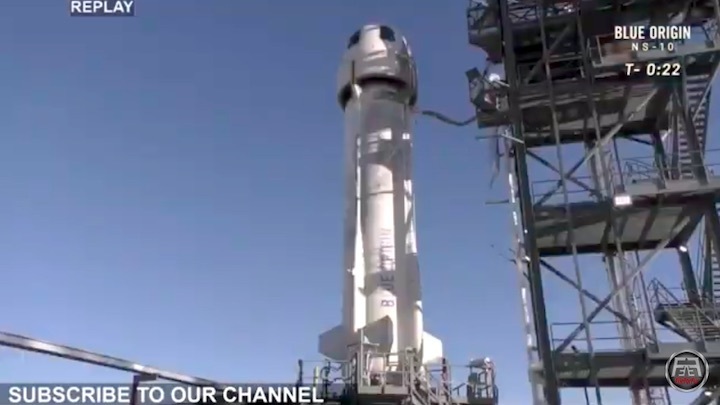 The launch will mark the 10th flight of a New Shepard rocket, and the fourth flight of the reusable New Shepard vehicle currently in service. When it takes off, the flight is expected to climb to an altitude of more than 60 miles — or 100 kilometers — powered by a hydrogen-fueled BE-3 engine. NASA research payloads will fly inside a crew capsule on top of the New Shepard booster, but no passengers will be aboard the launch. 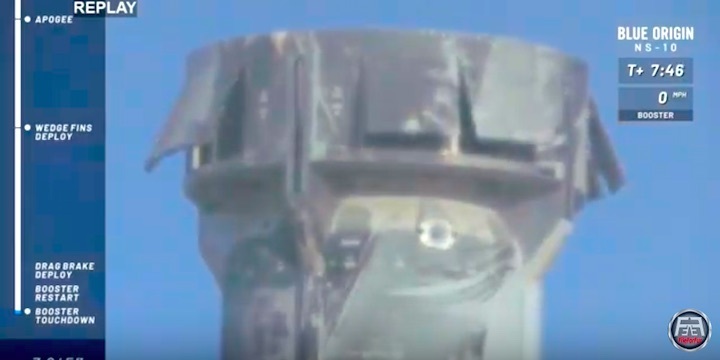 The booster and capsule will separate after shut down of the rocket’s main engine. 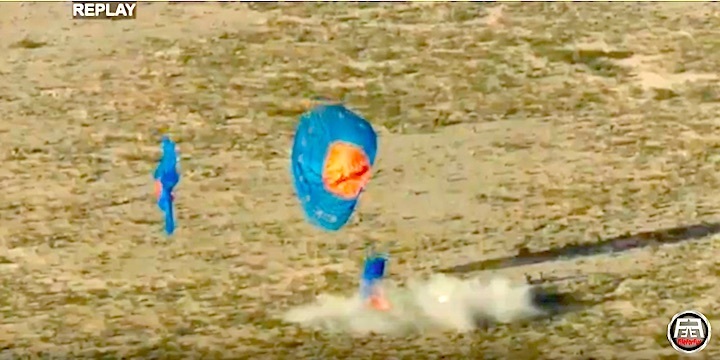 Both vehicles will come back to Earth, with the rocket aiming for a controlled vertical touchdown on a landing pad with the help of a braking burn from a hydrogen-fueled BE-3 engine, and the capsule parachuting to the desert floor a few miles away. Ariane Cornell, Blue Origin’s head of astronaut strategy and sales, said at an industry conference Jan. 8 that the next New Shepard flight is a stepping stone before the company begins flying employees, and eventually paying passengers, to the edge of space and back. 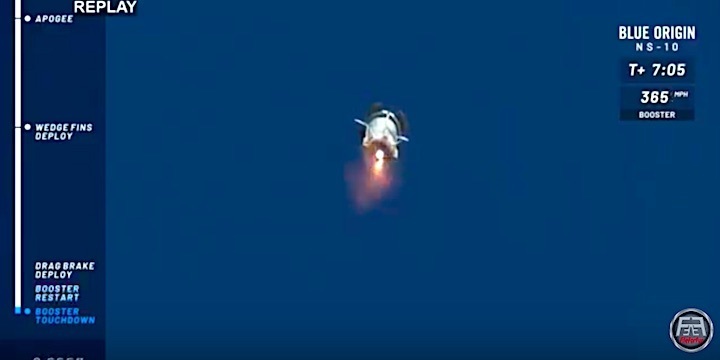 The upcoming launch will be Blue Origin’s first flight since July 18, when engineers demonstrated the vehicle’s high-altitude abort capability. 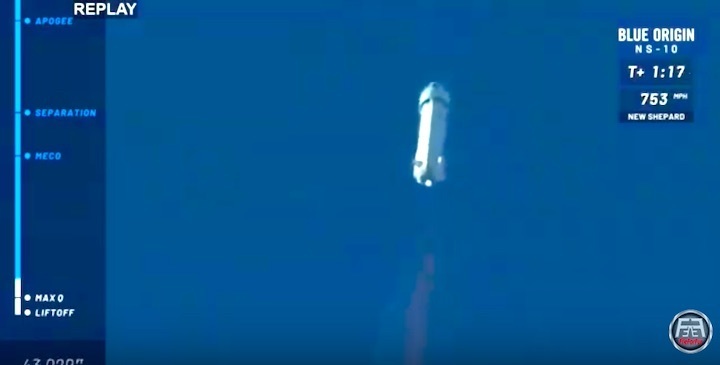 Blue Origin is currently flying its third New Shepard booster, after losing the first vehicle during a landing accident and retiring the second rocket. A fourth New Shepard rocket has arrived at Blue Origin’s West Texas launch site from the company’s headquarters near Seattle to prepare for flights with people. Blue Origin’s main competitor in the suborbital space tourism market — Virgin Galactic — flew its SpaceShipTwo rocket plane to the edge of space for the first time Dec. 13 with two test pilots at the controls. The SpaceShipTwo rocket plane reached a maximum altitude of 51.4 miles, or 82.7 kilometers, on last month’s test flight, above the 50-mile mark used by the U.S. Air Force and the Federal Aviation Administration to determine who gets awarded astronaut wings. Blue Origin’s New Shepard flights, none of which have carried passengers or employees to date, have reached altitudes over the 100-kilometer (62-mile) Kármán line, the internationally-recognized boundary of space. 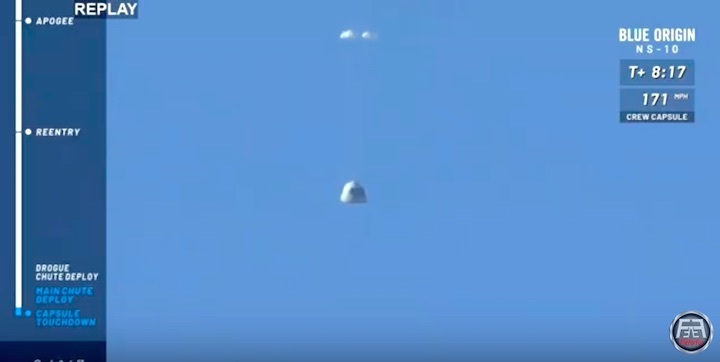 An April 29 New Shepard test launch flew to an altitude of 351,000 feet, or about 107 kilometers. Bezos said that is the altitude Blue Origin targets for operational New Shepard flights. While Blue Origin has not announced a ticket price and is not accepting applications for a ride, Virgin Galactic says it has received deposits from hundreds of people for a $250,000 ticket to space, where passengers will experience several minutes of weightlessness. Blue Origin is developing a much bigger rocket named New Glenn to carry satellites, and eventually people, into orbit. Using a new booster engine design burning methane fuel, the New Glenn is schedule for its first launch from Cape Canaveral in 2021, Cornell said. Blue Origin’s New Shepard spacecraft and its hydrogen-fueled BE-3 rocket engine are built at the company’s headquarters in Kent.